With Summer days drawing to a close, and chilly nights taking their place, you’re in need of some warmth to replace the sun’s bright rays. That’s why we’ve created the Summer Shawl. There’s no need to give up your walks on the beach or dinner by the seaside just yet. The Summer Shawl is cozy enough to make up for the sun’s absence, at least until next summer. And this shawl goes with anything in your closet. Because it’s made with two colors, you can really personalize this wrap to fit your personality. Or you could make two! One in bright, summer colors. And another in tonal autumnal shades. It’s so versatile and cozy. The Summer Shawl will be sure to become a staple in your wardrobe. 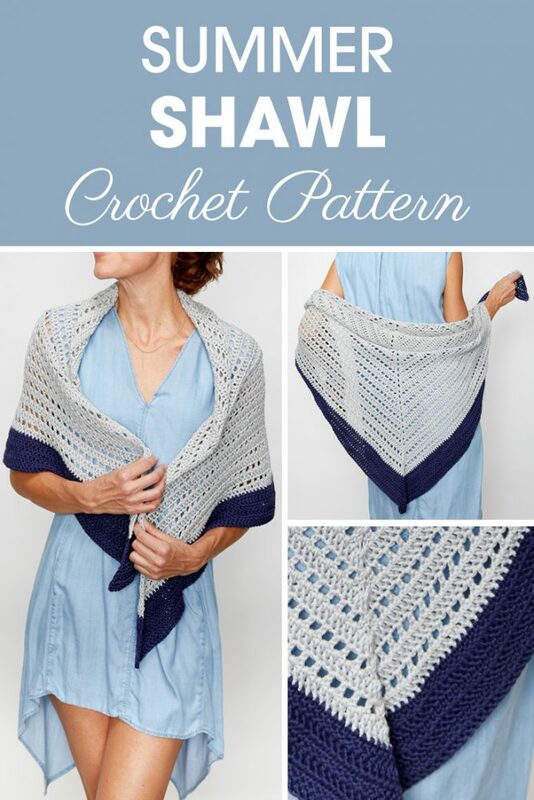 Get The Summer Shawl Crochet Kit Here while it’s still available. Yarn: 4 skeins Berroco Modern Cotton in Gadwell, 2 skeins Berroco Modern Cotton in Hope. 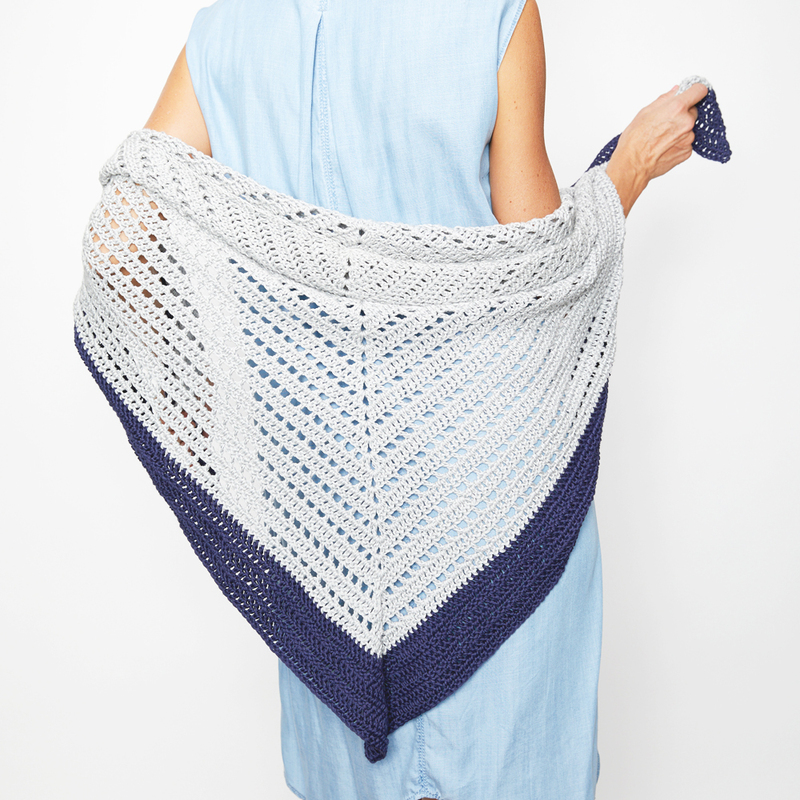 Get this yarn and the digital pattern in the summer shawl kit we put together here. Row 10: Dc into first st, *ch 1, sk 1 st, dc* to chain 3 sp. Ch 1, sk last st, (2 dc, ch 3, 2 dc) in ch 3 sp. Ch 1, sk next st, *ch 1, sk 1 st, dc* 2 dc in last st. Rows 42-47: Dc into the first st, and each one to the ch 3 sp. (2 dc, ch 3, 2 dc) in ch 3 sp, dc in each st down with 2 dc into the last st. Break yarn, weave ends. The Summer Shawl is the perfect piece to wear to a romantic dinner by the ocean. Or to keep you warm as you watch your grandkids play around in the summer sand. You won’t even miss the warmth of the sun when you’re snuggled up in this wrap. Don’t let the colder temps keep you from your summer adventures. Take charge and embrace your inner adventurer today by making this shawl! We are also on Instagram, follow us there for the latest website updates!